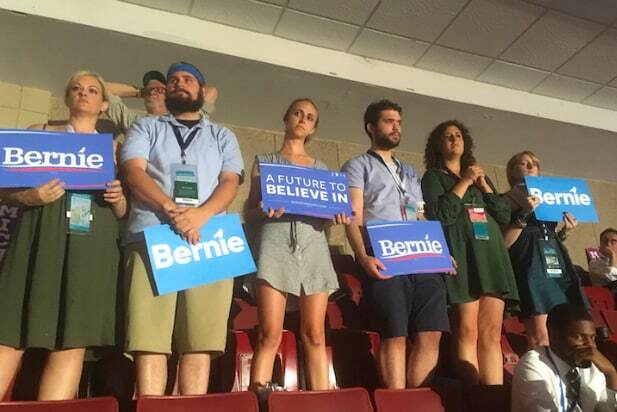 They are in the fourth-to-last row of the entire Wells Fargo Center in Philadelphia, six of them, cheering on Bernie Sanders’ every word. There are many, many Sanders supporters like them, even here in the arena where Hillary Clinton plans to accept the Democratic nomination on Thursday. When Sanders finally says — more than 10 minutes into his speech — that Clinton must be the Democratic party nominee, it is the first moment in his speech that the six don’t hang on his every word. Clinton needs them, and she doesn’t have them — not yet. The obvious goal of the first night of the convention is persuading Sanders supporters to join Clinton, so that the convention can move on, and get unified. So that Hillary Clinton can beat Donald Trump. Some people don’t want to get unified — not yet. The conflict was obvious before the night even started. People who got off the train at Wells Fargo Center that afternoon were greeted with a sea of pro-Sanders slogans. “He’s not out. Not until the delegates vote,” Brooks, 27, proclaimed, adding that she might vote for Green Party candidate Jill Stein. Sarah Silverman, a former Sanders supporter who has gotten behind Clinton, said from the stage Monday that the Bernie-or-Bust crowd was being “ridiculous,” and that it was time to back Clinton. For some of them, that time may yet still come. His name is Jim Jeffers, he is 27, and he is from Philadelphia but has traveled the country as a Sanders volunteer. (In the picture above, he’s the one with the backwards hat and the beard.) 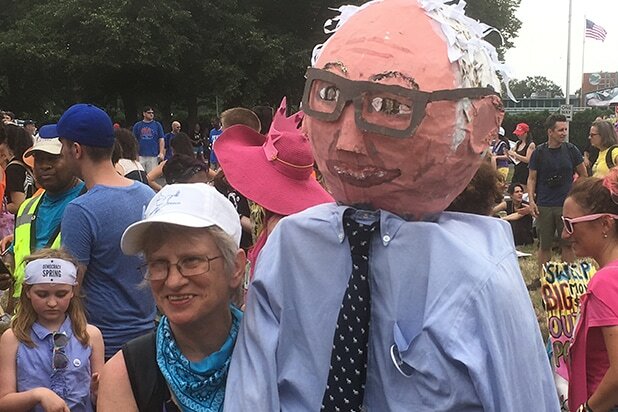 He and the other six are members of a group called Reclaim Philadelphia, and they don’t trust the Democratic National Committee — especially after leaks over the weekend that indicated the DNC backed Clinton over Sanders. They say what they’re doing is a revolution. “But it is necessary,” Strausbaugh adds.